Canadians Tessa Virtue and Scott Moir wowed the fans and judges with their sultry Flamenco moves on Sunday to upstage Russian favourites Oksana Domnina and Maxim Shabalin in the Olympics ice dance event on Sunday. The Canadians, who are renowned for their inventive lifts and imaginative choreography, sent the crowd into a frenzy after scoring a mighty 68.41 for their original dance. They lead the field with a combined total of 111.15 points. Virtue and Moir's seductive performance raised hopes of Canada winning their first ever ice dance gold medal on Monday. Americans Meryl Davis and Charlie White also impressed with their hip-shaking Bollywood moves to slot into second place with 108.55 while world champions Domnina and Shabalin dropped from first to third with 106.60. Davis and White, wearing an eye-catching ghagra choli and sherwani suit, brought the crowd to their feet with what they called an Indian folk dance, only their footwork was more Bollywood than traditional dance. The free dance will be later on Monday. Domnina and Shabalin were expected to steal the show with their infamous aboriginal dance and costume that had caused an uproar at the European championships last month but they were deemed only third best on the night in the original dance. Their fall from the top of the standing may send alarm bells ringing in Russia because if they cannot make up the 4.55 points deficit in the free dance, the European powerhouse will likely draw a blank in figure skating gold for the first time since the 1960 Olympics. 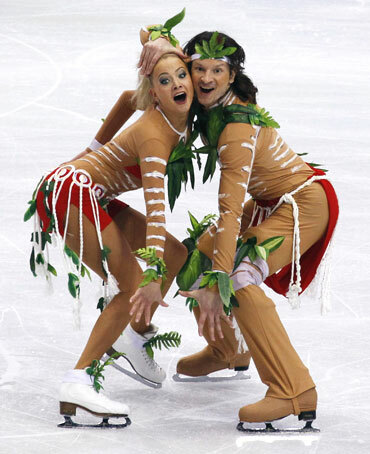 Domnina and Shabalin stripped down to the bare minimum for their latest routine wearing green leaves and red loin cloths. The Russians performed their interpretation of an aboriginal folk dance with playful choreography which ended with a nose-to-nose greeting.